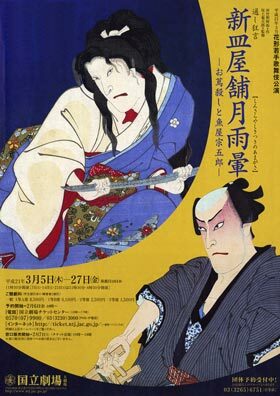 The play "Shin Sarayashiki Tsuki no Amagasa" was premiered in May 1883 at the Ichimuraza [casting]. "Shin Sarayashiki Tsuki no Amagasa" was originally in 3 acts. It can be divided into two different parts, "Otsuta Goroshi" (the Murder of Otsuta) and "Sakanaya Sôgorô" (Sôgorô the fish seller). Otsuta comes from a commoner family, but the daimyô Isobe Kazunosuke has fallen in love with her and made her his mistress. Unfortunately, she has become the object of lust of the retainer Tenzô, who is plotting together with his brother to take over the clan. When Otsuta refuses Tenzô’s advances, he takes advantage of the situation by claiming that she is having an affair with a young samurai in the mansion. When the lord hears this he is furious and kills her. Sôgorô, a fish seller, has taken a vow to not drink, but when he learns about the unjust murder of his sister Otsuta at the hands of the daimyô Isobe Kazunosuke, a death that they were told was execution for her wrongdoing, he starts to drink again. Drunk, he storms into the lord's mansion to seek an apology. (*) the title "Moonlit Umbrella at the Dish Palace, New Version" comes from the 4th volume of "Kabuki Plays On Stage".